Paris has had many different sets of “walls” that marked the limits of the city, built successively by the Gauls, the Romans and various French kings, up to the modern Boulevard Périphérique which more or less follows the current boundary. Most were built for defence reasons, but one in particular had a different purpose. The “Wall of the Farmers-General” was built between 1784 and 1791 and roughly followed the route now occupied by lines 2 and 6 of the metro. It wasn’t meant to repel invaders, but to ensure that any merchants who wanted to enter Paris to do business paid a toll on their goods. The wall had 61 magnificent toll barriers designed by Claude Nicolas Ledoux. All have disappeared except four: the Barrière du Trône (now Place de la Nation); the Barrière d’Enfer (now Place Denfert-Rochereau); Barrière de Chartres in the Rotonde du Parc Monceau; and the most impressive of them all, the Barrière Saint-Martin in the Rotonde de la Villette (on what is now Place de la Bataille de Stalingrad). 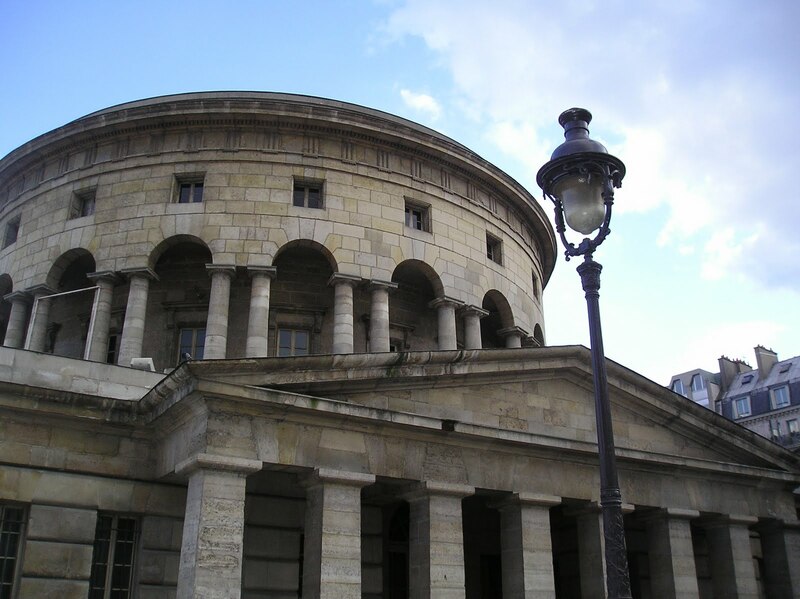 The rotunda is built in the neo-classical style. On the ground-floor level each of its four façades comprises eight pillars topped by a triangular pediment. The upper level is the rotunda proper, composed of 20 pairs of Doric pillars. Unfortunately, the view of one side of the rotunda is rather spoilt by the curved viaduct of the metro, but the newly-restored building can be admired in its glory from the side facing the basin. The Rotonde de la Villette is no longer a place where tolls are extracted from passing merchants. However, those who enter are expected to contribute to the coffers of the State by other means: through tax on alcohol! It now houses a trendy bar/brasserie.